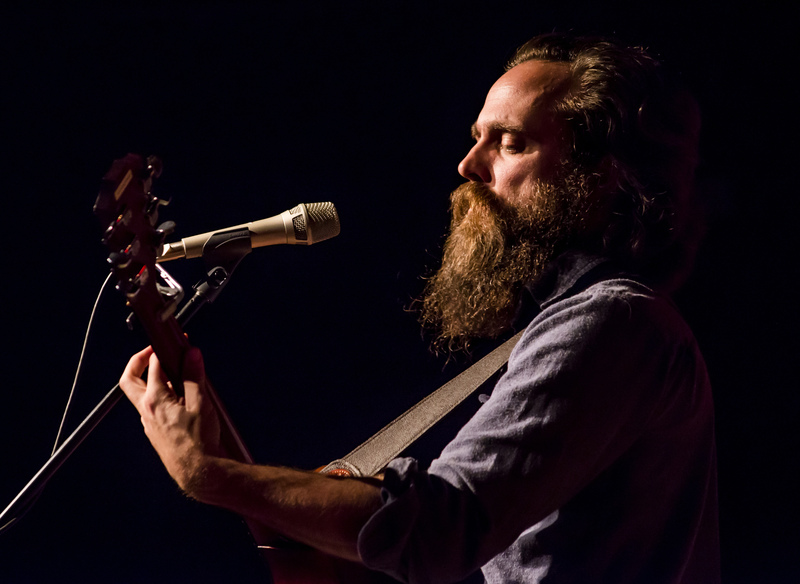 The American Soundscape of Iron and Wine. Samuel Beam, of Iron & Wine, came from South Carolina where America is old. As a young man he was educated in Virginia, where the tobacco grew wild and where the first cities of a nation were built. From there he went to Florida, the land of alligators, where the pensioners roam. Beam’s past residences have influenced his music and his lyrics. Using acoustic string instruments and minimal percussion, he is able to conjure up images embedded deep in the American psyche. Slow and rhythmic chord progressions mesh easily with visions of trucks, moonlight, and the Fourth of July in wind-blown wheat fields. Finger picked guitar and banjos scamper over hummed melodies. In his newest album, which paradoxically contains some of his oldest songs, this aesthetic is as present as ever. However, Iron & Wine fans might be a bit surprised by what they find. After sixteen tracks the listener definitely becomes acquainted with the band’s aesthetic. In this album, Archive Series Volume No. 1, the first of a series, fans will find “otherwise unreleased recordings, covers, live sets, and curiosities from his entire career.” While the songs are unmistakably Beam’s creations, they sound much more pared down than songs of his more recent career. Given that they are from his early stages, this makes sense. Yet for all the novelty and merits of this album, there are some drawbacks. For instance many of these songs are most definitely songs written “after the kids were asleep,” as a press release from the band’s website states. Almost painfully slow and equally quiet, the songs are not exactly exciting to listen to. Additionally, even though these are songs from the early stages of his career, some of them seem simply half finished. “Everyone’s Summer of ‘95” is a good example of this, with Beam half humming and half “doo doo doo-ing” to a chorus that goes nowhere. The imagery in these pieces gets quite repetitive as well. At least a quarter of the album has opening lines referencing either setting suns or moonbeams. And yet the album does have diversity. Perhaps not in the musical stylings, but in the lyrics. A particularly striking line comes from the song “Quarters in a Pocket.” It goes, “Time spent with you feels like charcoal sketches for a painting you won’t let me see.” If that line were in a novel it would be worthy of putting the book down and reflecting for a moment. In a rare break from form, the song has a driving banjo melody that helps build the song to a crescendo, an indication that this one would be fun to see live. All in all, the album is a great buy for die-hard Iron & Wine fans. It offers a unique perspective on an established artist in his early stages. For the uninitiated, it drags on a tad. The songs are pretty, but nothing life changing. They would make the perfect soundscape for a return trip down a sunset-lit road. Check out the album, available now, and learn more about the band on the Iron And Wine website. Catch the band in a town near you. Tags: Archive Series Volume No. 1, Evan Nyarady, Everyone's Summer of '95, Florida, Iron & Wine, Moonbeams, Quarters In A Pocket, Samuel Beam, Setting Sun, South Carolina, tube magazine. Bookmark the permalink. Previous post ← Tuesday Is The New Friday.